No doubt some of the goals of the production were clear upfront, "I hoped to produce... a show which helped contextualize the creation and performance of [the music at the Barberini court] where every musician represented an historical figure. It's essentially historical fiction: the plot is made up, but the conditions are all based on fact," says Henning. 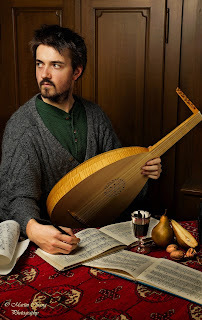 His production last month focused on the music of Giovanni Giorolamo Kapsberger, a German-Italian virtuoso lutenist and chitarrone player, but also included appearances by other notable musicians, such as Girolamo Frescobaldi, Galileo Galilei, and Dario Castello. While Rome 1623 was more musically-oriented, entertainments of this sort have great potential to generate links across artistic disciplines (think of a poem being recited, or a painting being unveiled to its patron, etc. ), a potential Henning sees exploring in the future. Unfortunately, that comes at a cost, he notes, "because it's basically theater with a heavy emphasis on music, to do this at a professional level you would need to approach it differently: you'd need a producer (that is to say, someone who creates the program, writes the script, does the research), and likely the musicians would have to develop secondary skills (acing, public speaking, dancing, singing)." The benefits, however, outweigh the commitment, he argues. Henning's concept was driven by an underlying feeling for the need to change the format of an early music concert. "There is something lost in the modern concert setting when presenting this earlier music [which pre-dates the Public Concert]," he says, "but when we do it in an atmosphere which is closer to the original performance scenario, despite it being staged, it can be much more engaging." Most who watch Henning's YoutTube video will miss a punchline or two. As a four-year veteran of the Schola I found moments like Hopkinson Smith's 'cameo' hilarious, but regular members of the public (a minority in the packed Kleiner Saal) were not as receptive to some of the inside jokes. The entertainment was conceived as location-specific, and it did feel as if the production was made 'just for us' in those moments of humor. Fundamental to his concept, says Henning, is that it boils down to "presenting the music in a certain atmosphere which pulls the audience in." No doubt most of us present that night would agree that we had been transported.